These are the show notes to an audio episode. You can listen online right here by clicking: http://media.libsyn.com/media/airspeed/AirspeedKneupper.mp3. 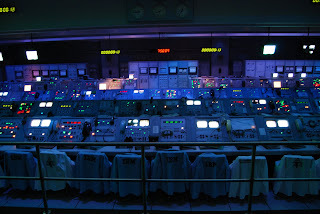 If the music right after the Airspeed theme in this episode seems familiar, the chances are good that you’ve paid a visit to the Apollo/Saturn V Center at Kennedy Space Center in Florida. I fell in love with the music in 2001 during my first visit to KSC and watching Atlantis go up on STS 101. Airspeed is as much about the inspiration behind aviation and aerospace as anything, and it struck me as that I ought to try to get the composer of that music on the show to talk about the music and what’s behind it. It turns out that there’s a whole lot behind it – Like being present at several launches, being a pilot, and having strong family ties to the US space program. David Kneupper [kuh-NIE-puhr] is an award-winning composer and sound designer currently living in Los Angeles, specializing in original music for museums, theme parks, film, and the concert stage. David holds both a Master of Music Theory and a Ph.D. in Fine Arts from Texas Tech University, and has composed extensively for Universal Studios, the Walt Disney Co., Warner Bros., Six Flags, and many others. Recent projects include music for the Abraham Lincoln Presidential Library and Museum in Springfield, Illinois, music for the US Pavilion at World Expo 2005 in Japan, and music and sound services for TimeRiders, a ride film starring John Cleese. In addition to entertainment projects, David composes actively for the concert stage, and is the recipient of numerous commissions and awards for creative excellence. His Passacaglia and Fugue Rondo received its Carnegie Hall debut in 1993. David is also an award-winning sound designer for both themed entertainment and feature film. His film credits as sound supervisor include What Dreams May Come, U-Turn, Sudden Death, Terminal Velocity, and Bad Company among many others. He is a member of the Motion Picture Sound Editors Guild, and former President of the Academy Award -winning Soundelux, the largest independent film sound company in Hollywood. We caught up with David by phone at his office in Los Angeles. Want to buy a copy of the music? 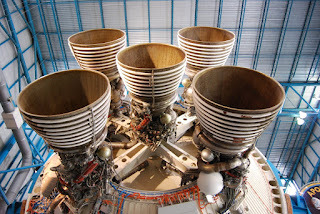 Try the KSC Space Shop at http://www.thespaceshop.com/ and/or call them at (321) 449-4444. I’ve had no luck in finding copies for sale at KSC since my first visit, but David says that he recently re-mastered the music and provided it for printing new CDs. If you want to buy a copy, call them up and let them know that you want one and, if you find out how they’re making it available, please e-mail me at steve@airspeedonline.com so that I can update the show notes! Excerpts from The Music of Apollo Saturn V Center and The Star of Destiny used for comment and criticism as permitted by 17 USC 107 (fair use). I have just returned from the Kennedy Space Center and they have know Idea if they are gonna have this music back.